Using giant mobile phones, a chilling campaign is displaying the heart-breaking final text messages sent by motorists just moments before they were killed. THESE chilling final text messages written by drivers killed on the road will make you think twice about ever touching your phone in the car again. A new hard-hitting campaign has been launched to warn motorists of the dangers of texting and driving. Part of the Northumbria Safer Roads Initiative “Road Respect”, the campaign shows the heart-breaking final text messages sent by drivers moments before they were killed. Travelling around England’s north-east, the Last Text Tour uses giant mobile phones placed in city centres to display the thought-provoking texts. 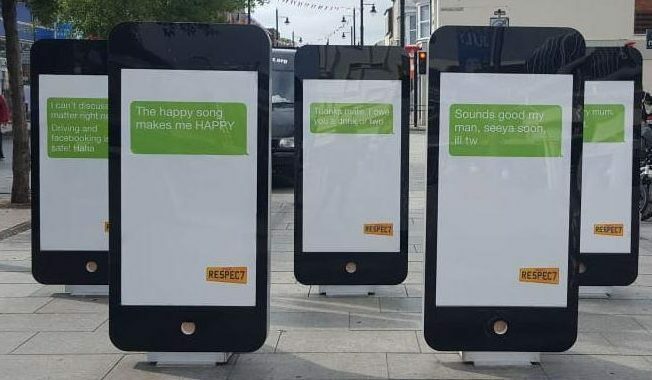 Most recently seen in Sunderland, the six-foot tall phones also show a description of what happened on the road the day the driver passed away. The Last Text Tour arrives in Sunderland today on Market Square. One driver said “the happy song makes me HAPPY” just moments before they were involved in a fatal accident. Tragically, the recipients of the messages never got to see the sender alive again. According to the Department for Transport, the number of drivers killed or injured where mobile phone use contributed to an accident has risen significantly in recent years. And on top of the obvious safety risks, drivers face tough penalties if caught using their mobile phones while in the driver’s seat. Since new laws came in last year, mobile phone convictions for drivers carry a £200 fine and six penalty points. When is it legal to use a mobile phone behind the wheel? Skipping music, declining a call or unlocking your phone:Illegal. Any physical interaction with your phone will be classified as “using it”. Programming your phone as a sat nav: Illegal. You must set the route before you turn on your car and set off on your journey. Using hands-free/Bluetooth kits: Legal. As long as you aren’t distracted from focusing on the road. Using your phone when the car is stationary. e.g. in traffic or at a red light: Illegal. While the engine is on and you are in control of the car, it is illegal to touch your phone. Sitting in the driver’s seat with the engine switched off: Legal. As long as you are pulled over to the side of the road in a safe location. Using voice commands. e.g. Siri: Legal. But only if you don’t need to touch your phone at all to do so, and aren’t distracted from driving. If you have to pick up your phone to enable voice commands, it is illegal. Road Respect’s No Look, No Touch, No Phone campaign hopes to discourage drivers from using their phone at all while they are in the car. A spokesman for Road Respect said: “The visual nature of the texts aims to draw people’s attention in, with the sobering message behind the phones really resonating with drivers and passengers alike, with the outcome being the encouraging of behavioural change behind the wheel.